I’m obsessed with street food. I definitely don’t let my vegetarian restrictions or varying lack of language fluency stop me in trying out new and interesting street side delicacies, no matter where I am in the world. 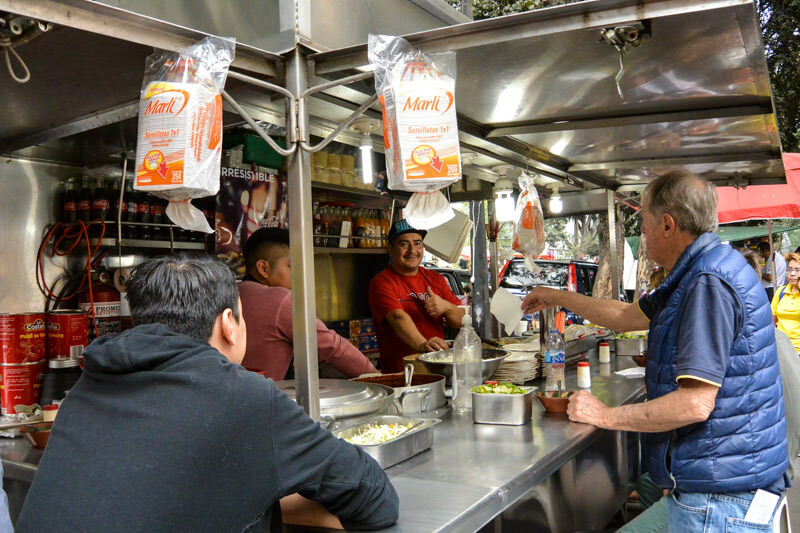 And Mexico City street food is certainly no exception. 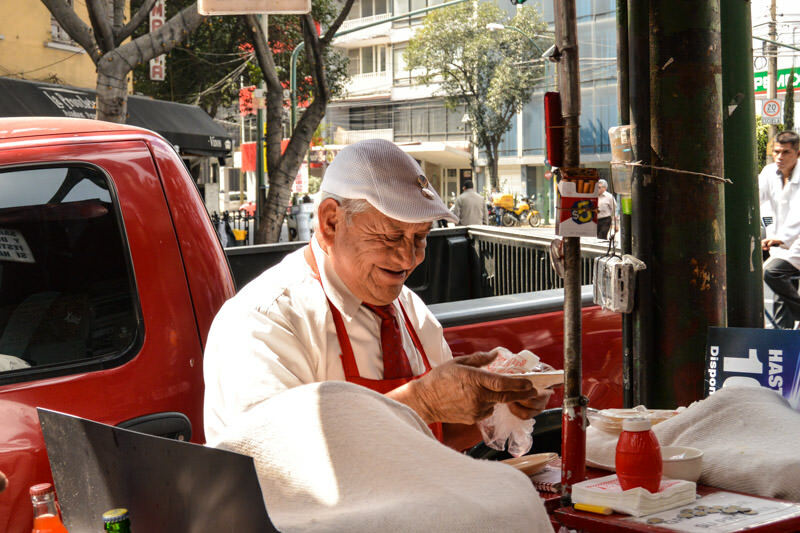 I’d already been living in Mexico City for 2 months (and eating my way through an extraordinary number of street food treats) when I heard of Eat Mexico‘s Mexico City Street Food Tour. 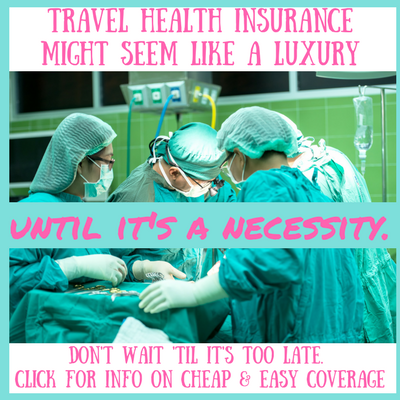 At first glance, it might seem that a tour is best suited to tourists, but that assumption is totally wrong! I’ve found that taking tours in the city I live in gives me a much deeper understanding of many aspects of culture (in this case: FOOD!) and makes me a better, more informed citizen of the city. Not to mention it’s just fun… especially when the tour involves eating new foods and learning more about the history and cultural importance of each item. I set off on my guided street food expedition hungry in more ways than one. 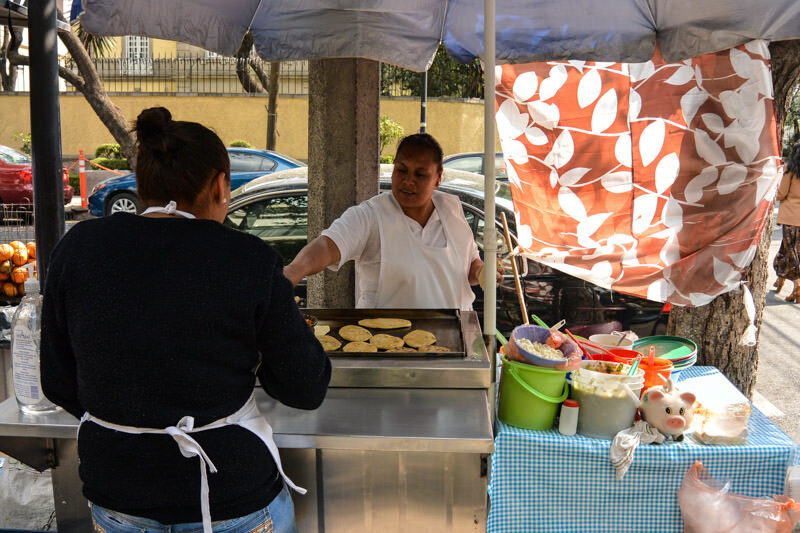 I was pretty famished from skipping breakfast in anticipation of a few hours of chowing down, but I was also hungry to learn more about Mexico City street food than Wikipedia had previously offered me. I arrived to the meeting point at Sanborns a bit early (it’s that American in me, if I’m not 5 minutes early I feel like I’m late), and was surprised to see the guide Paco was even earlier than me! We had a few minutes to chat before the other tour participants arrived, and then set off on our culinary exploration. 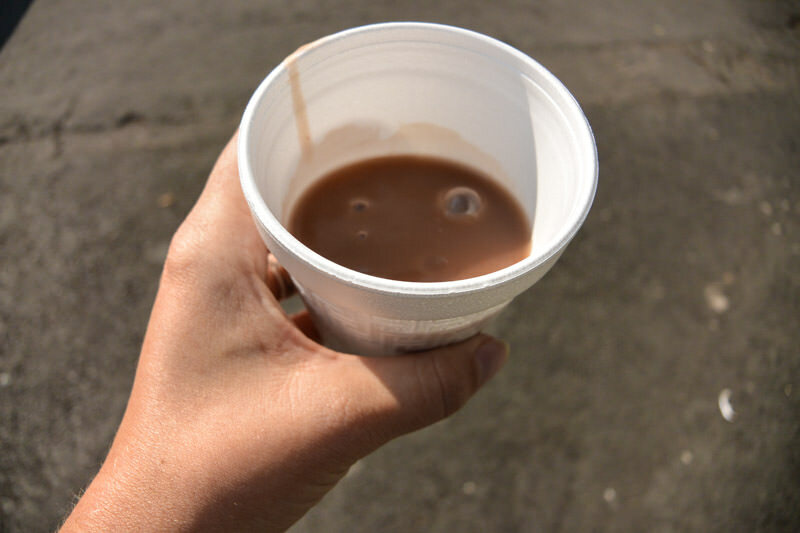 Tamales are often paired with atole, a thick sweet drink that reminds me of pureed oatmeal (but not in a bad way). 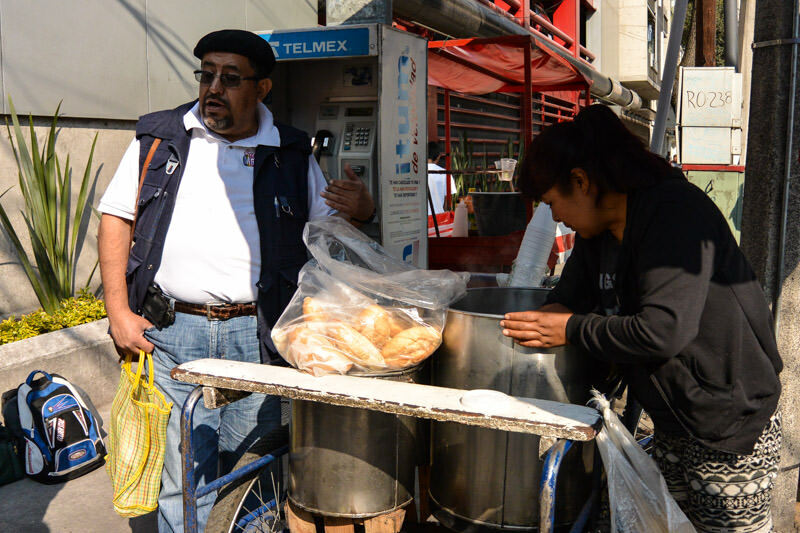 Paco explained that most tamale sellers are women, who make their tamales at home in the early morning hours before bringing their fresh tamale-filled carts to popular spots, especially street corners. People on their way to work will then stop and grab a tamale and maybe a cup of atole. 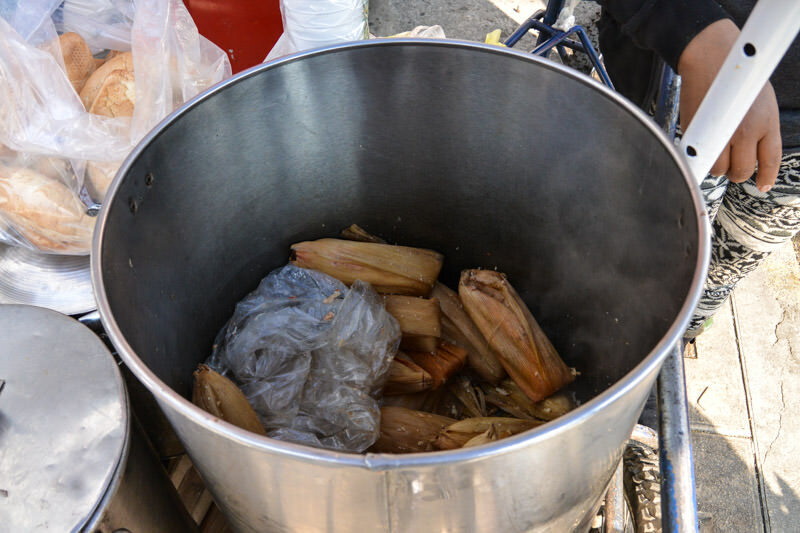 Each tamale vendor will have her own special recipe, usually passed down through the generations of her family. 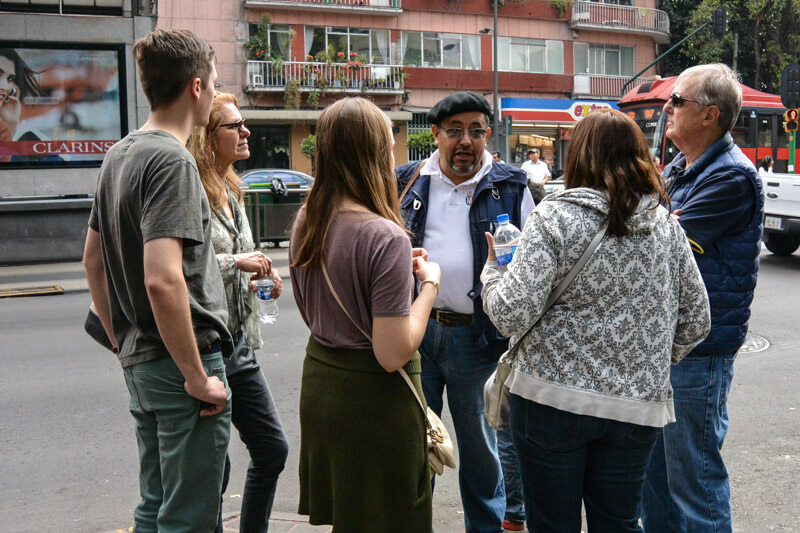 Before proceeding to further street food eats, Paco led our group through a typical Mexican market selling flowers, vegetables, fruits, fresh meat, and more. 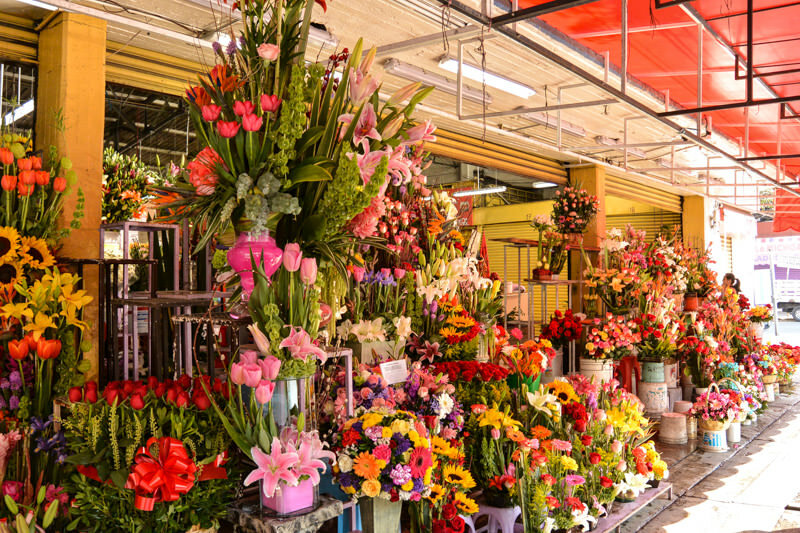 The market is enclosed, very busy and bustling, and packed with vendors offering a crazy wide variety of produce (everything from corn fungus to bright yellow chicken carcases to flower arrangements and more). 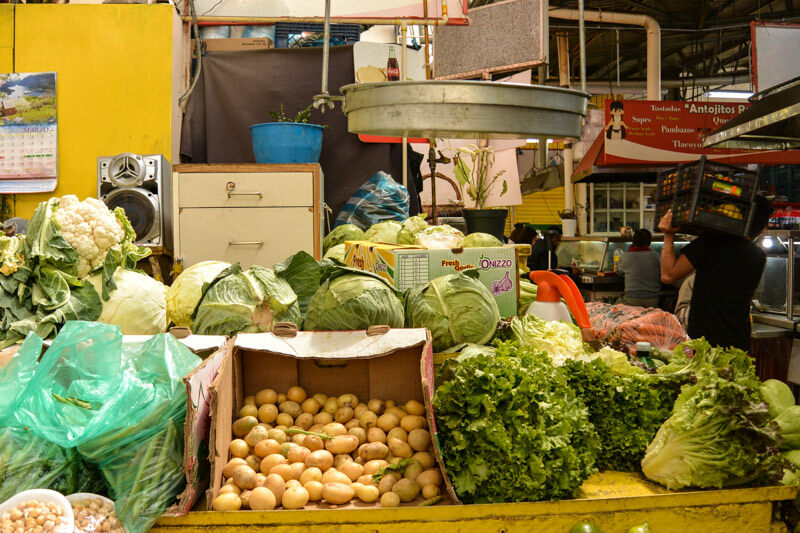 A visit to a local market is an absolute must for any visit to Mexico! 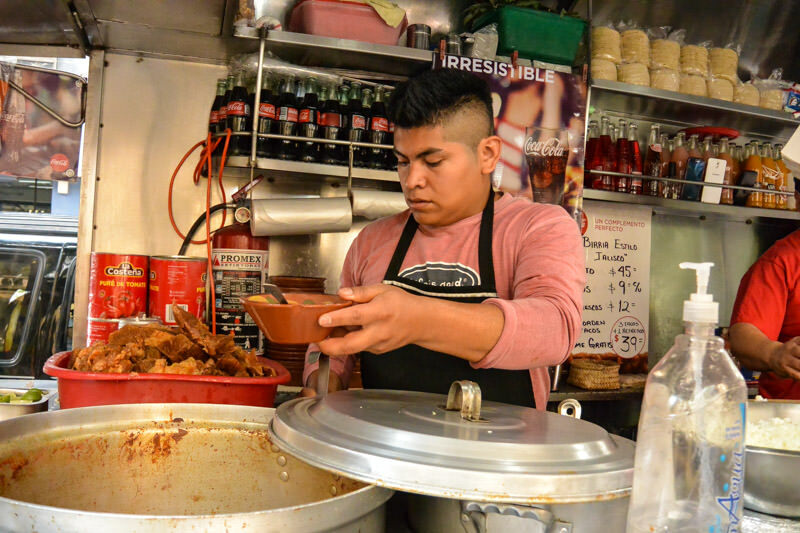 After the market, we stopped by a traditional tortilleria called Tortilleria El Gallo. If your tortilla experience has been similar, you’ve got to visit a tortilleria. The difference to store bought tortillas in the US is night and day – tortilleria tortillas are made the old fashioned way and are absolutely DELICIOUS: soft, supple, and tasty enough to be eaten on their own or with a light sprinkling of hot salsa. YUM! The tortilla equivalent of a bakery, tortillerias are usually family owned. They make corn tortillas in small batches, to be bought each day and used fresh. Sadly, these former neighborhood institutions are slowly going out of business, being replaced by huge chains (cough cough walmart) but there’s no doubt that the tortillerias are the true artisan experts of their craft. 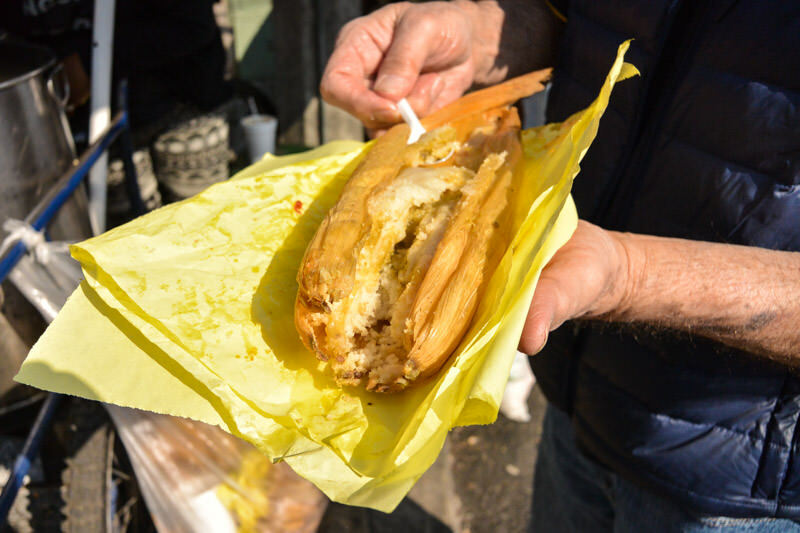 Be sure to visit a tortilleria before they are all gone! 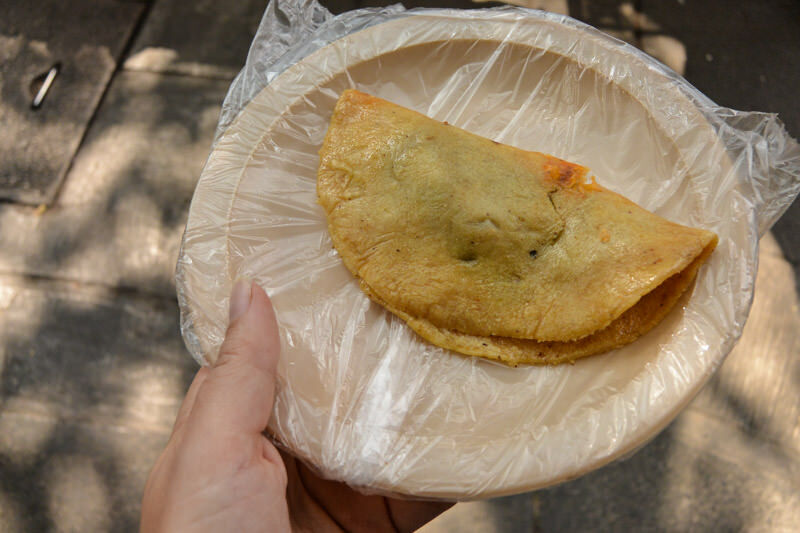 Our next stop was a total new street eat for me: a tlacoyo. 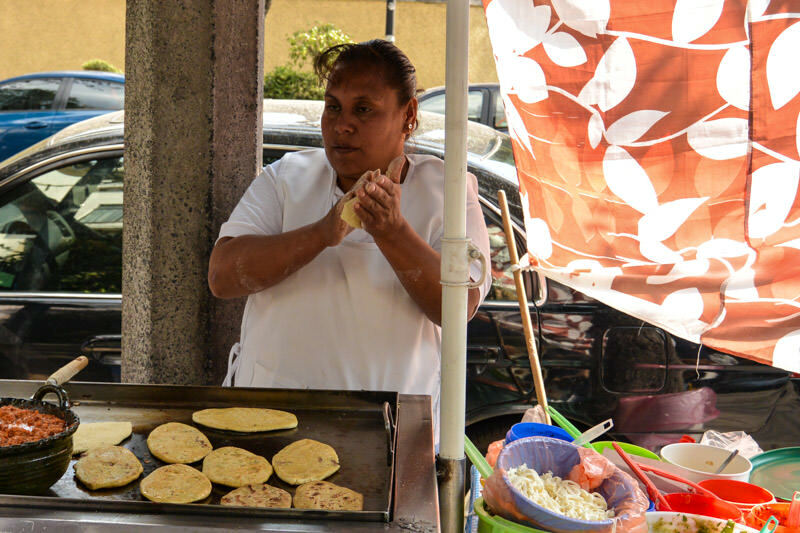 A sort of thicker, oval-shaped tortilla, tlacoyos are made fresh to order for each customer. 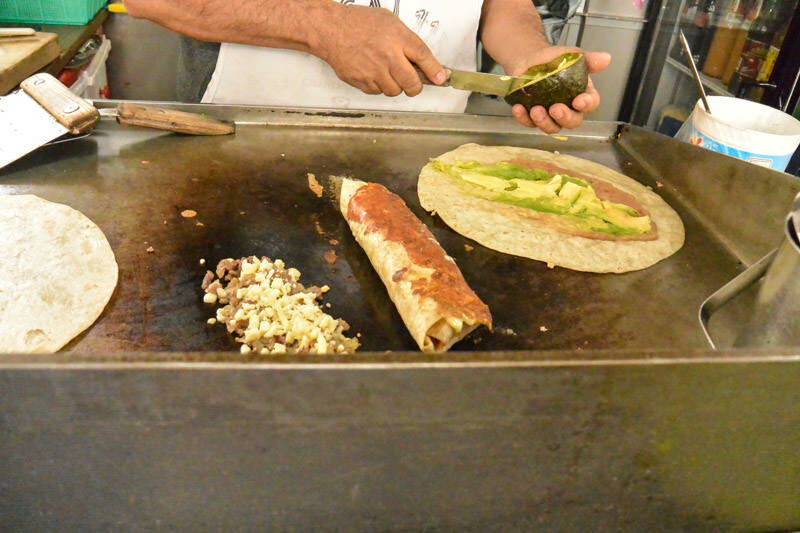 The tlacoyo vendor will roll out the dough and put whatever toppings on it the customer wants – with a wide variety of vegetarian options available. Tlacoyos become hard and dry quickly, so they’re best if eaten hot and straight from the skillet. 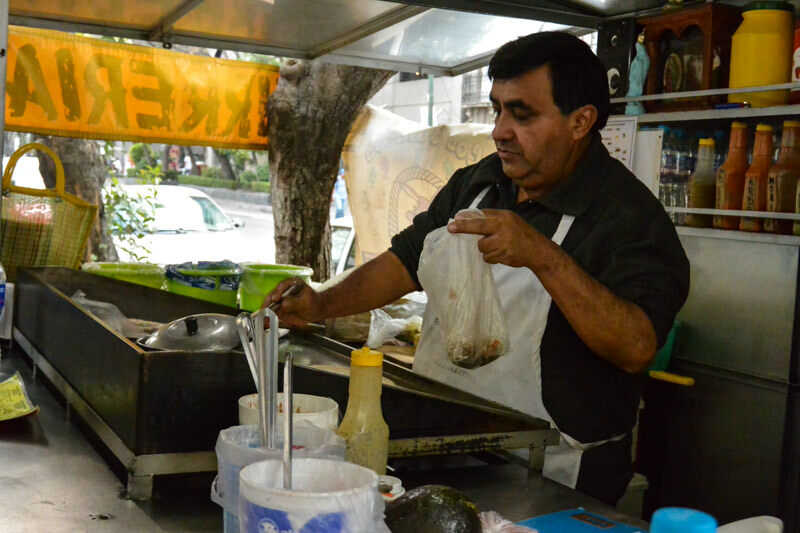 After receiving your cooked tlacoyo, you can use the salsas and toppings (shown here to the right of the vendor) to personalize your creation. 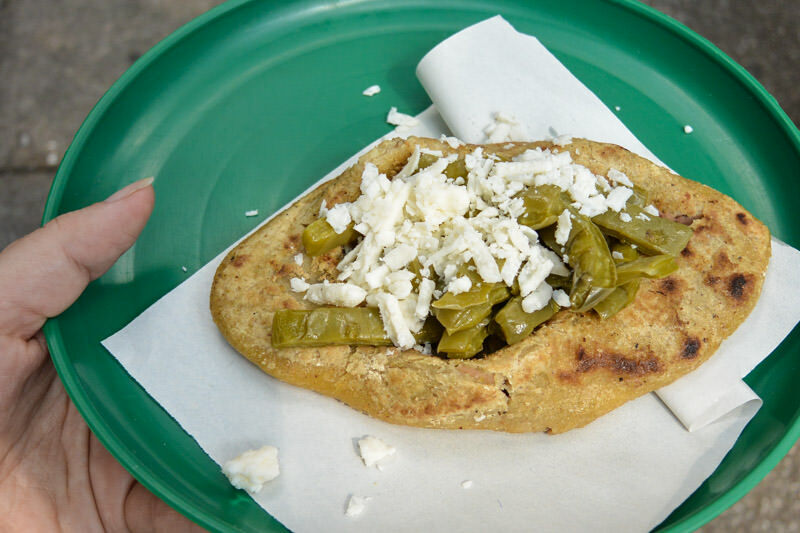 my tlacoyo: nopal (cactus), cheese, and beans! They are soft, squishy, and prepared by steaming. 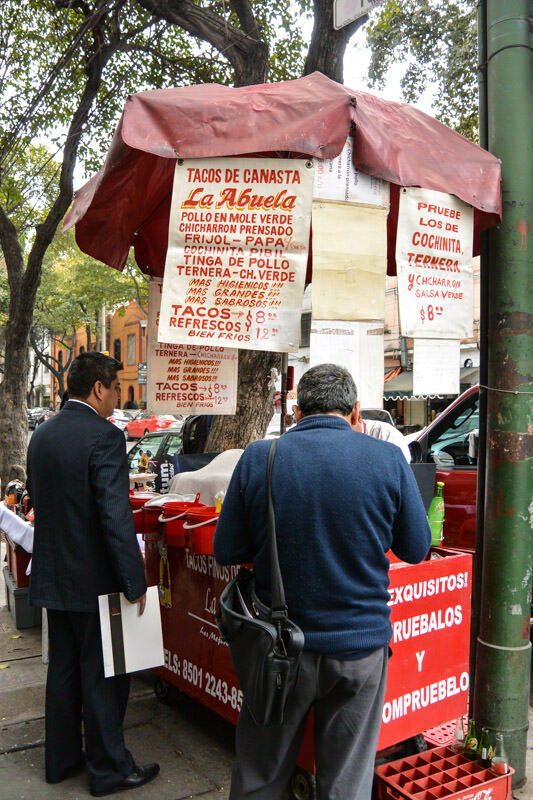 After the vendor prepares the tacos for the day, he or she usually leaves them in a covered basket to keep them moist and warm. While that doesn’t quite sound appealing (slippery steamed tacos? ), it’s worth a try or at least a visit to the taco stand to check it out – especially if you’re visiting this guy. 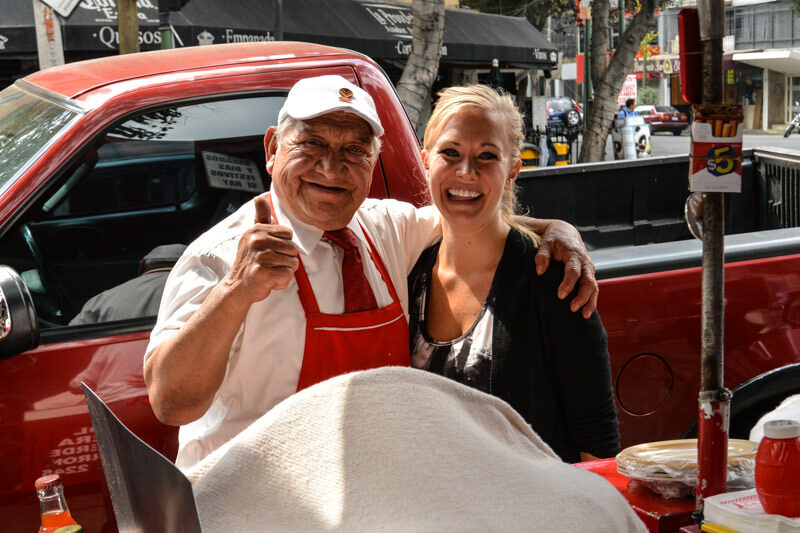 Definitely the most charismatic and cutest street food vendor I’ve EVER run across, the grandpa to Grandma’s Tacos is a total character. Make sure to check out the photo tacked to the beam of the stand of him climbing a volcano in his youth. What happens in Mexico, stays in Mexico. And sometimes, a few too many tequila shots definitely go down. When you’re facing a killer hangover, the traditional remedy is this street food: hangover soup (though it’s also a popular lunch spot). This particular vendor even offers a cute little bar-style seating area, just in case you aren’t too steady on your feet. 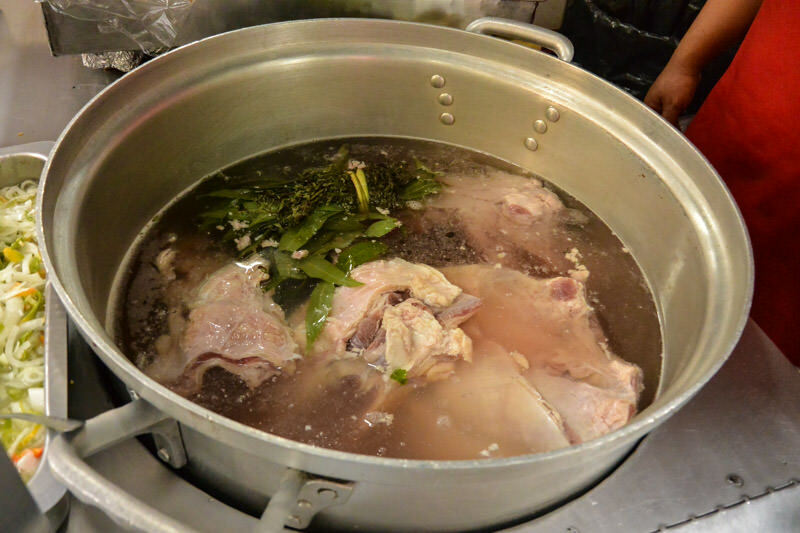 The soup features a strong broth, along with some herbs and shall we say… interesting cuts of meat. You can choose to garnish it with your choice of lime, hot sauce, salt, and fresh veggies. While the soup definitely isn’t vegetarian (or kosher), so I didn’t get to try it, the guys running the stall were super friendly and if they ever come up with a veggie option I know where I’ll be spending my day-afters! Almost the last (but certainly not the least) stop was for burritos. With an wide array of options, the vendor makes each burrito fresh in front of your eyes and can personalize ingredients. He already had several vegetarian options on his menu, which was awesome to see! Of all the stops on the tour, I think the burrito had to be my favorite. The grilled veggies, delicious avocado, and spicy (but not too spicy) salsa formed the PERFECT combination. I think I found my new favorite street food spot!! 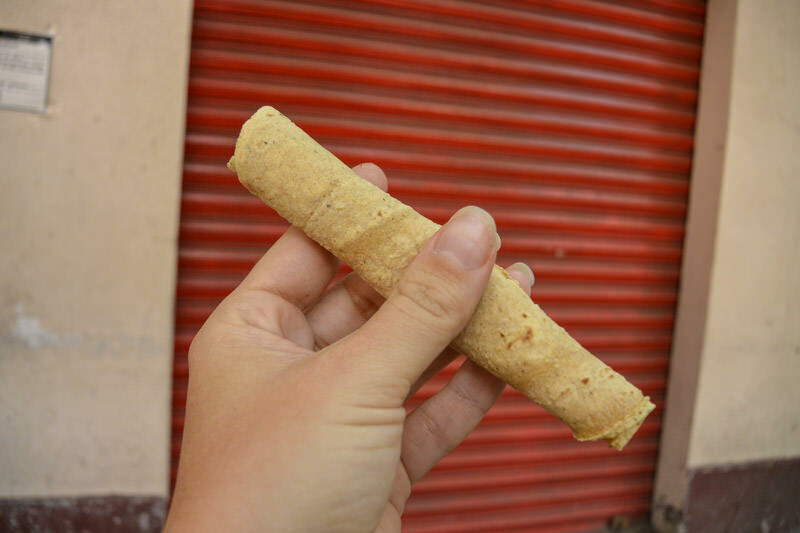 The very last stop on the tour was to a traditional Mexican sweets shop called Celaya. The cute little shop has row upon row and display upon display of candies, chocolates, cookies, and more sweets than I even have names for! 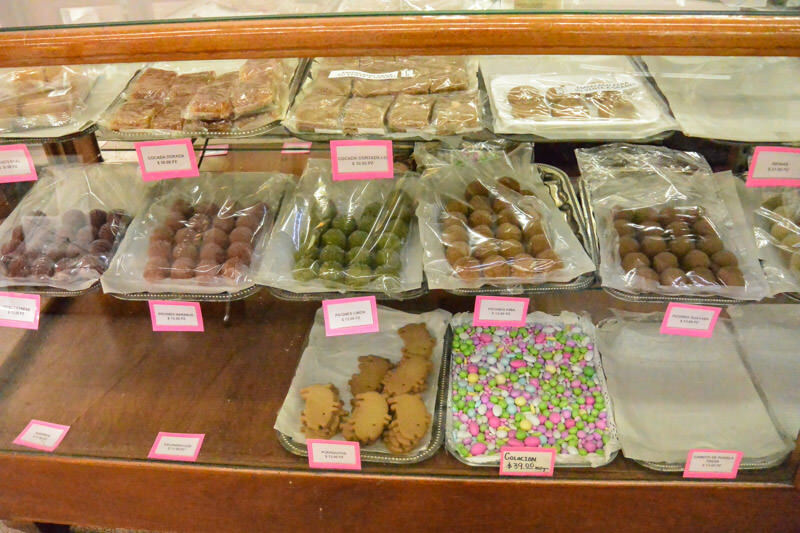 I’m not even a big sweets fan, but I loved everything that I tried in the shop. Several members of the group also picked up sweets for presents for family back home – they would make excellent, pretty, and authentic gifts! 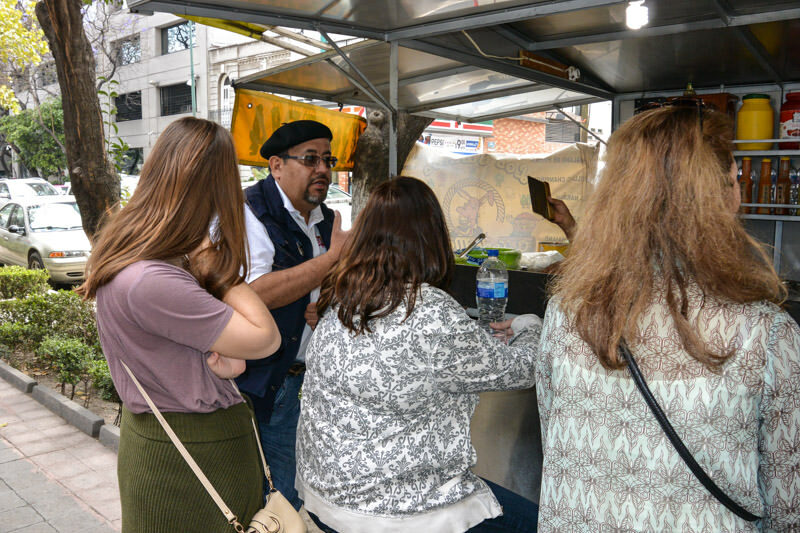 I was absolutely blown away by the quality of the street food tour. On top of all of the knowledge I gained (like discovering tlacoyos and finding my new go-to burrito spot), I had an absolute blast. Paco was personable, friendly, knowledgeable and fun. He created the perfect balance between learning, eating, and enjoying. For anyone afraid of Montezuma’s revenge (or run of the mill street food poisoning), the spots Paco brought us to were all run by friendly vendors who welcomed photos (not always a given) and who kept their stalls immaculately clean and with excellent hygienic standards. We even made a few spur-of-the-moment stops (not pictured here) including for a pambazo (a delicious sandwich sure to spoil your diet) and fresh juice. I actually felt like I was going out to eat with a friend, which is a spectacularly unique feeling and definitely hard to create on a group tour. 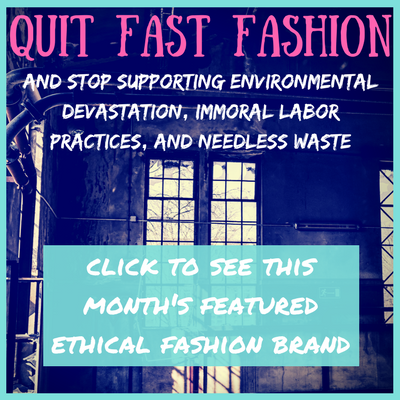 I felt very comfortable to ask questions, as I think the other participants did as well. 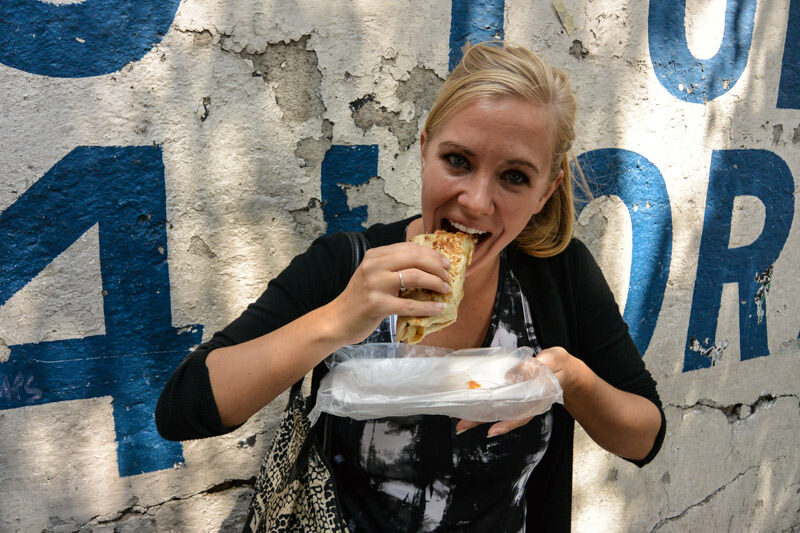 You can book a range of food tours with Eat Mexico. 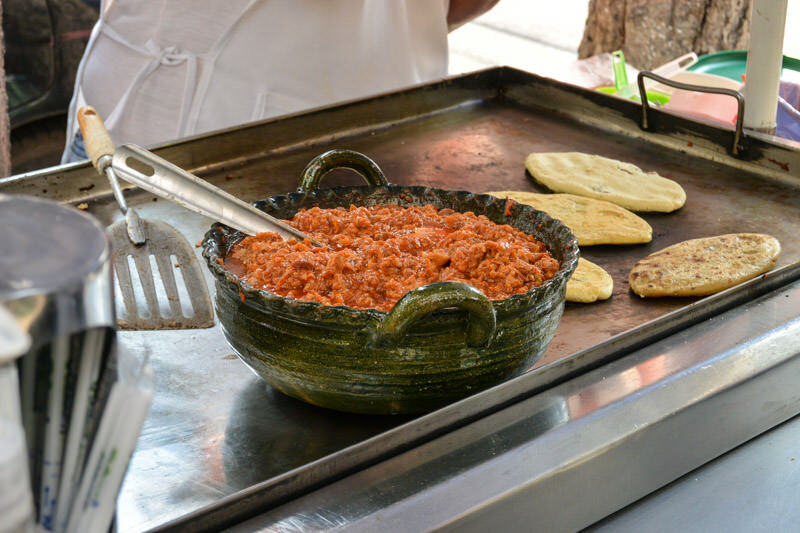 While I went on the Mexico City Street Food tour (the best option for vegetarians), there are many other options for carnivores. The tour lasted just short of four hours and costs $85. 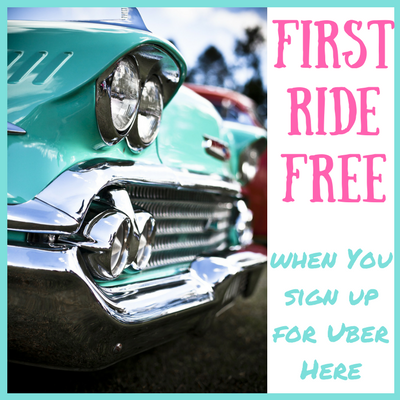 Tours start at 9:30am or 1:30pm and are available Monday through Friday (many of the street food stalls close on weekends). 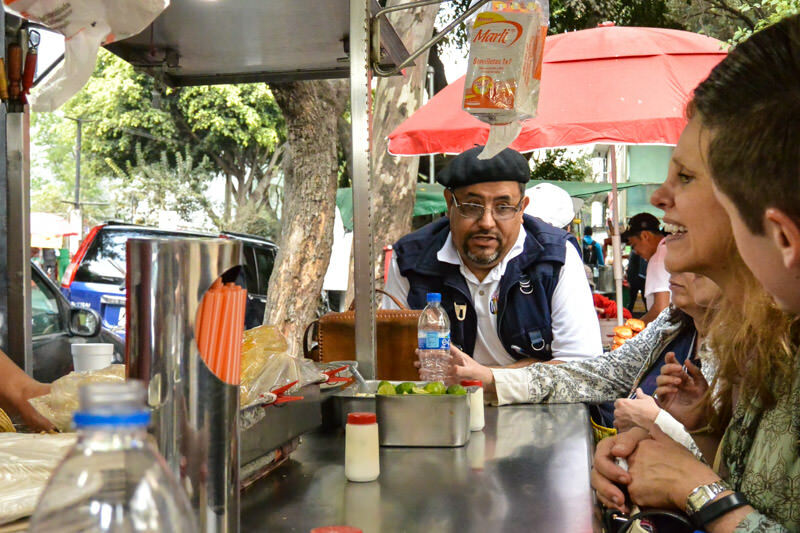 The tour is within the Cuauhtemoc neighborhood, and involves a fair amount of walking though the pace was slow and included frequent (food) stops. I’d definitely recommend skipping breakfast especially if your tour starts in the morning. Remember to bring a camera or phone for photos and a bottled water (some of the food is SPICY!). Be sure to let Eat Mexico know of any food restrictions before booking your tour, so that they can direct you to the best option for you. While not all stops had vegetarian options (meat is a big thing in Mexico), including 3 of the main stops, this wasn’t a problem for me. I had MORE than enough food at the others stalls. I was more interested in the food culture of Mexico (which is largely NOT vegetarian) than I was in eating at every single stop. To keep in mind if you are a strict vegetarian like me: Paco informed me that all of the tamales were made with pork lard, the soup was made with a meat-based broth (and filled with meat), and the canasta tacos were made with chicken broth. 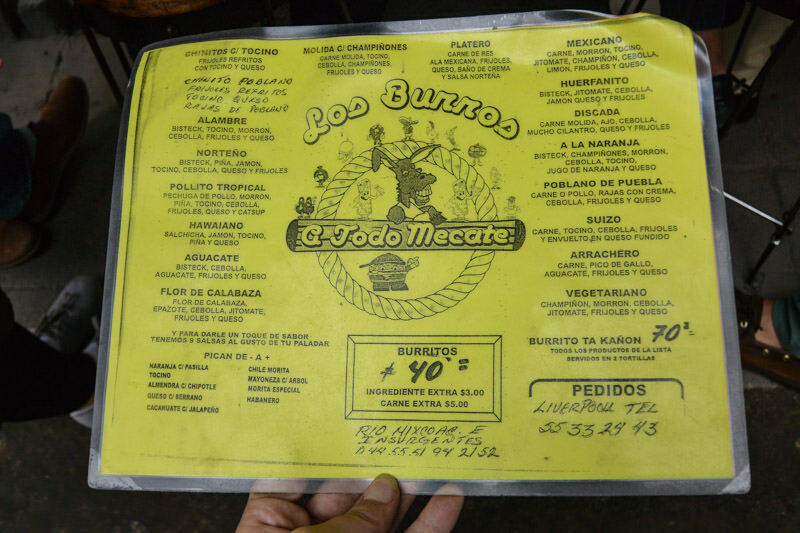 Whether or not the beans I ate in the tlacoyo had lard in them was debatable (Paco said it was vegetarian, but one of the other tour participants warned me otherwise). the sauced meat definitely isn’t vegetarian… but many other options were! 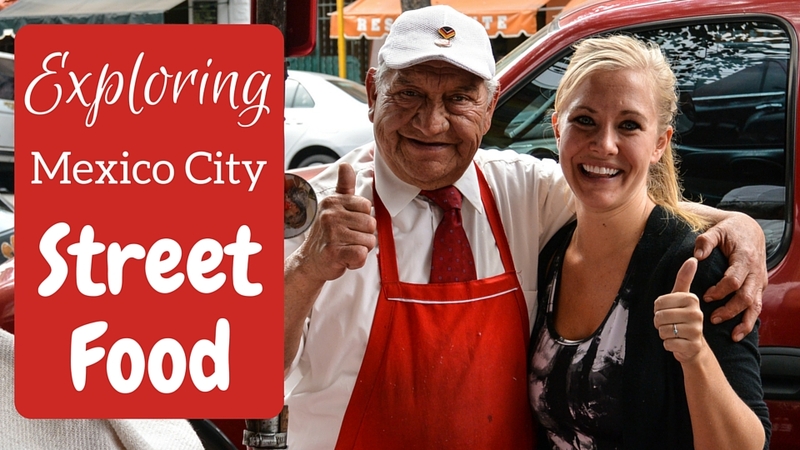 Have you ever tried a street food tour? 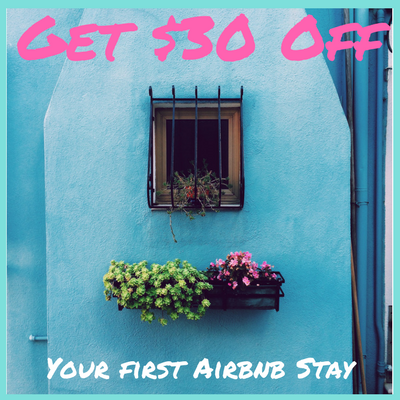 (Especially a Mexico City street food tour?) What did you think? I love your style of writing. 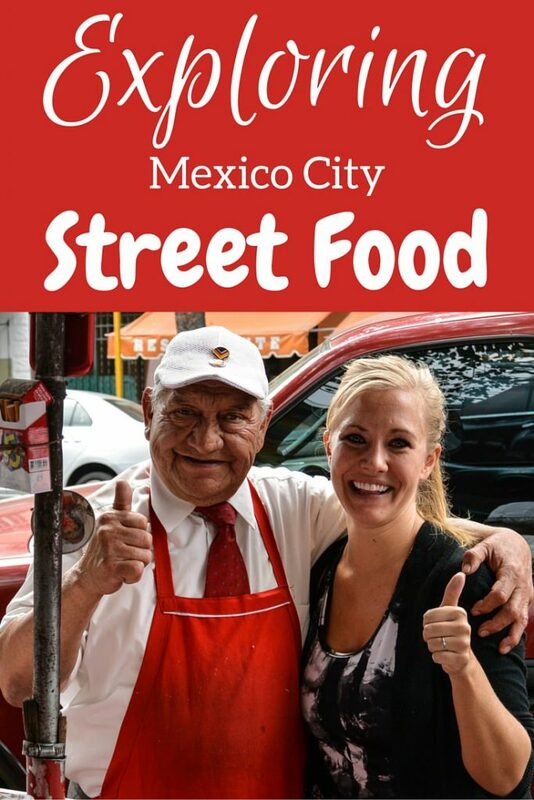 Very interesting reading your food journey in Mexico. I enjoyed reading it till the end. Thanks so much and I’m so glad you liked it! Hi Peter! 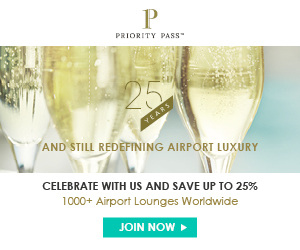 Thanks so much, I would love to come on one of your trips. Do you have an email address I could contact? I’m in Guatemala this month and the US the next but would love to set something up for September!